Do you believe your job, as organizing events and readings, is more integral in a way than the actual catalogue of books being sold? Of course, most of these events are free, and they’re curated, I’d imagine, as some way to help make money for both the author and the store. And I’ve heard people say that the readings, too, are what foster this sense of a neighborhood. How much of that do you think is true, these events serving sort of dual purposes? We have a three-fold mission in booking events: to grow community; to grow awareness; and to grow sales. That last one might sound less exciting than the other two, but it’s how stores stay in business. The event booking, to me, is inseparable from the books we sell. As a community bookstore we try to stock whatever it is that our readers are interested in, no matter the genre or type of book. And then watching what people get excited about, what books do the best in-store, helps us know what kind of events people are interested in. Trying to book without having the everyday sales data would feel incredibly difficult, like being blindfolded and then trying to find a needle in a haystack. But the events are how the reading community meet each other; otherwise, readers are ships in the night, passing by each other in the stacks. So I think you’re right; the events help keep the store in business, and having the store in business fosters a literary neighborhood. What constitutes a good reading, or event, in your opinion? I’ve been to some that are fantastic — the interviewer, say, well-versed in the author’s works — and I’ve been to others where it seems as if the people participating are there out of obligation. How much guidance do you give, or is your job, mainly, getting them to show up? This is both a really easy question and a hard one. The simple answer is, any event that effectively forges a connection between readers and authors. But the path to creating that is a twisty, complicated one. It doesn’t necessarily depend on the number of people in the audience. I’ve seen incredible events that had maybe 12 people at them and really awkward events that had hundreds, and vice versa. I do think that a lot of authors who wouldn’t otherwise tour are pressured to do so for the publicity and the sales, and that is hard. Some people are not great at reading on stage, or feel very uncomfortable fielding questions from a live audience, but authors don’t always get a choice in doing these things. So the job of the events manager and the author’s publicist is to try to create an event in which their author can shine. Sometimes that means bringing in an interviewer, like you mentioned, or maybe having them do a presentation rather than a reading. In my experience, though, it’s not always gimmicks that make a good event. An engaged, enthusiastic crowd can do a lot to bring out an author, and an author who throws themselves into an event for the fun of it can really engage an audience. The magic really happens when you’ve got both. You spoke about how, as an events director, you spend a lot time with authors’ respective publicists trying to create the perfect event. My question, though, is how you decide which writers you’d like to read at WORD. I assume some of it has much to do with who has a forthcoming book, but of course, you can’t have everyone. How much is it your doing? Do you have to actively pursue artists to come to the store, or do their publicists tend to seek you out? Or is it a mix? He’s one of our all-time favorites, and he’s not touring the US, so we worked with his publicist to put together a virtual event. But we also get a lot of proposals from publicists, since Brooklyn is such a popular tour spot and since so many authors do live in the neighborhood. Your job is a unique one, and this particular question is a simple one: how’d you end up where you are? How much of it diverged from how you originally saw your career path to be? How’d you land in Brooklyn? I got really lucky! I graduated college with a history degree, and most of my friends were going to graduate school. I knew I didn’t want that, but didn’t really have a clue what else to do. I’ve always been a big reader, so I figured I would work in a bookstore for a little while while I figured it out. Ten years later, I still work in a bookstore, and I have yet to find the career I’d rather have. Building bookish community is the best job — you get to talk to people about books, you get to meet the authors and the people in the publishing industry that make all this possible, and you get to watch readers and authors connect. I ended up in Brooklyn after having worked at a few other bookstores around the country; they were looking for a full-time event manager, I was looking for an opportunity to move to the New York area and work with some of the people I’d already met through conferences. It turned out to be a once-in-a-lifetime opportunity. This may seem like a stock question, but one I’m always curious to know: what authors are you reading now? And not only that, but what authors are you always going back to? Right now, I’m reading a galley of Brian Francis Slattery’s newest novel, The Family Hightower, which is a Ukrainian mafia family story. I just cracked that one open, but I’ve read everything he’s written, so I’m very excited for it. And the book I can’t stop telling people about is Eimear McBride’s A Girl is a Half-Formed Thing, which is being put out in the United States in September through Coffee House Press. This phrase gets overused, but it really is a stunning debut novel; I’m a fast reader, but I had to keep pausing the reading. The prose and the emotion in it were so intense. Is there an author you haven’t gotten a chance to work with that you’d like to? Oh gosh, so many. I think the ultimate would be Ursula Le Guin, who doesn’t really tour anymore. She’s an incredibly formative author for me, and being able to hear her read in person would be a dream come true. Other than promoting books and forging a connection with the audience, what other reasons do writers have to participate in these events? Do extremely popular authors tend to shy away (I’m thinking of someone like, say, Jeffrey Eugenides, though I do know he interviewed Knausgaard at the public library recently)? I think some authors genuinely enjoy readings; I imagine it’s something like being an artist and having a gallery opening. You get to watch people respond to your art in real-time, which has to be a great experience for any creative person. Most of the extremely popular authors I’ve met are very generous with their readers, even the ones who are otherwise known to be shy or reclusive. But there are always authors like Haruki Murakami or, famously, Thomas Pynchon who are just not interested. Are your events usually a stop on a book tour, or are they stand-alone? I mean stand alone in that they’re not part of a twenty city stop, and just a specific night you planned, for whatever reason. In that same regard (I don’t know how much you know about other cities) but do you think being in Brooklyn, or in the rising Jersey City, makes your job easier, because everyone tends to live here? It’s a mix, but probably weighted towards being part of book tour. Most of our events are organized around a newly published book, which means that the author is being sent out to do publicity and a tour. Some of our events are locally organized, or are for authors who don’t have a large publisher sponsoring a book tour. It’s more rare — although it does happen — for us to just organize an event around a theme, and then you have to just get lucky with who is around to participate. To the second part of the question, being in Brooklyn makes an enormous difference. I’ve worked for three other indie bookstores around the country, and getting authors in places like Salt Lake City or Baltimore is a much harder prospect. And those are urban areas with good bookstores; it’s even harder still if you’re in a fly-over state or a rural area. I remember being astonished the first year I worked for WORD at the caliber and quantity of authors we were able to host. It’s also a bit of an embarrassment of riches; the flipside is that we get event proposals that are great, but we have to turn them down because we just don’t have room in the schedule. Jersey City is fun because it’s got a growing literary scene, rather than an established one like Brooklyn, so we can try new things and see what sticks. 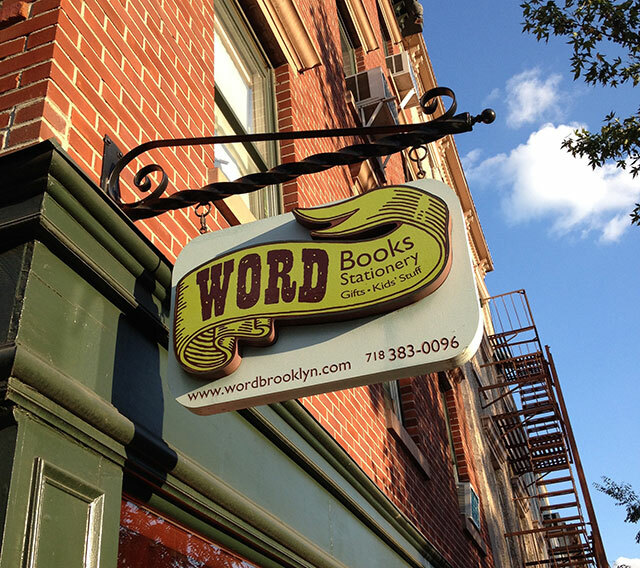 With independent bookstores being priced out of Manhattan, more and more are coming to Brooklyn, which is, of course, already home to many great establishments. As much as I’m a supporter of this community, do you think it’s only temporary, in the sense that, once Brooklyn rents go up, those bookstores will have to move elsewhere. Is this why Jersey City is a bit on the rise? I confess that I’m horrible at the real estate game (even four years of living in Brooklyn hasn’t made me any better at guessing what rents are going to do). But if I had to guess, I’d say that at worst the same thing that’s happening in Manhattan will happen in Brooklyn — some indies will close, but a few strong ones will stay open. I believe that communities can definitely keep a bookstore in business, even in high rent areas. Jersey City is definitely on the rise, though, and the rents are much more reasonable. How long they’ll stay that way, who knows, but it does feel like Jersey City is the sixth borough. What do you think it is about Brooklyn that attracts writers? I’ve heard Jonathan Franzen say (or was it in The Corrections) that it’s simply “nice,” like Old City Philadelphia but with the access to Manhattan. For people that don’t live in Brooklyn, do you think they are, in a way, missing out? I imagine it’s the same reason anyone comes to Brooklyn — it’s a beautiful city with a rich history. It’s also immediately adjacent to the center of the American publishing world, in Manhattan, which can make developing a career as a writer an easier prospect (although it’s ultimately never easy). But having lived a lot of other places, I can see how it wouldn’t be for some. There’s better weather in California; there’s better skiing in Utah; there’s better scenery in New England. And you can find literary communities in all those places, really vibrant ones. So I would say it’s a question of priorities.